White Door Diary: I just LOVE saving money! I just LOVE saving money! 1. The Sunday paper is available for *free* at TCU every week. We stop by campus on the way home from church or Brad brings one home on Monday so we don't spend the $2.00 it would cost each week. 2. Making sure I'm not hungry, I pull out the advertisement section of the paper along with coupons and discard the extra paper to feel more organized & calm. Find a large table or desk. Start by setting aside each coupon page you think you'll use (not cutting with scissors yet) and go through all coupons, relatively quickly. Re-evaluate its usefulness. HINT: Just because it's a good coupon, does not mean it's a good deal. Are you already planning on buying this product? Maybe hot dogs are already on your list so a coupon for Ballpark Franks is perfect! Read the fine print. For example, today, I found myself re-reading a 75¢ coupon for brownie mix. Great, right? Here's the catch: you have to buy two (like a lot of coupons) but you also had to buy two boxes of Supreme brownie mix. We don't like the Supreme styles so this would have actually wasted a few dollars, rather than save us money!! 4. 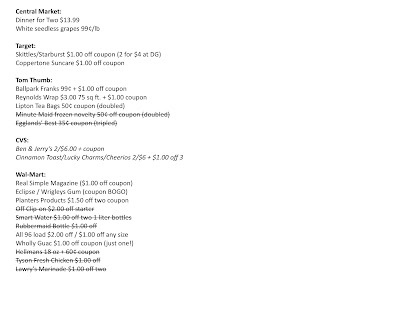 Organize coupons by categories like: frozen, meats, sauces/condiments, home (paper towel, toilet paper, cleaning supplies, etc), health & beauty, etc. This will help you in step number 5. 5. Go through each weekly ad/grocery story ad. These include: Kroger, Albertsons, Tom Thumb, CVS, Walgreens, Wal-Mart, and Target. HINT: Make sure the ad is current. Also, visit each website where the most current weekly ad is available. I would highly suggest reading the text and not looking at the pictures, as you will specifically identify what you need, and not what you WANT. Advertisers score when you make a decision based on packaging & presentation, not actual necessity. Tom Thumb - you can see the list above of the three items I needed. First of all, Ballpark Franks are normally $3.99 per package but were on sale for 99¢ each. That's a great deal alone BUT there was a coupon for $1.00 off two packages. So I saved a total of $7.00 on two packages of hot dogs and spent just $0.99!!! Then, 75 feet of Reynolds aluminum foil was on special for $3.00, marked down from $4.49. With a $1.00 off coupon, I saved another $2.49. With two other items (tea bags & hot dog buns), my grand total, including tax was $6.93. I saved $10.79 in just ONE trip to a store to buy just five items!! That's a savings of 61%. And, finally, we took a trip to Wal-Mart, where prices are lowest but coupons don't double or triple so I save all my coupons that are more than 50¢. I used eight coupons to save a grand total of $10.46. Check the prices of other stores on your list while you're in Wal-Mart because they're often lower than sale prices. Like today, I had cereal & ice cream on my CVS list, but at Wal-Mart each item was actually cheaper - I could compare because I had the prices written down - so it saved me a trip to another store with two kids in tow!! Grand Savings: $21.25 in just two hours, two stores!! Wooohooo!! do you take you kids?! that is the part that kills me... multiple stores with a not-so-patient 20 month old... i can't imagine with two!